. . . only to get pepper sprayed by the delicious- looking stranger who's taken over his house. She says her name is Jane, and she immediately sets down ground rules. Top priority: no touching. For Hutch that isn't easy�he was wounded in action, but one part is still working very well. Then Hutch learns the truth. Jane harbors a frightening secret�she's really Meredith Sommers, on the run from a dangerous ex-husband and desperately in need of the safety Hutch can provide. In that moment, he vows he'd do anything in his power to protect her. And as Christmas approaches, they discover that their love can conquer the past and overcome any obstacle�but what price will they pay? 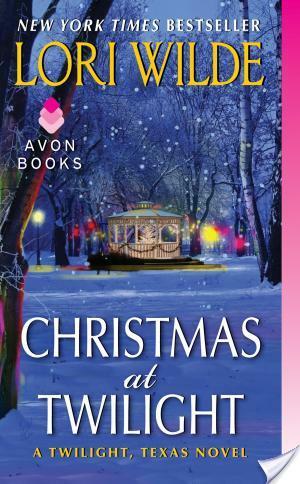 One of the best ways to get into the mood for the holidays is to read a Christmas romance. What I love about holiday themed books is that they are usually really fast reads and give me the chance to sample authors that I probably would not have considered trying out before. I’ve never read anything by Lori Wilde and typically her books aren’t really something that would immediately be on my radar, but again, Christmas romance allows me to try all kinds of things. Long story short, I ended up inhaling�Christmas At Twilight, Wilde’s holiday romance set in the middle of�her Twilight, Texas series. Meredith Sommers is hiding a secret. How she ended up in Twilight, Texas is a bit of a mystery and remains one. As the book opens, Meredith is renting the top floor of a house from another single mother named Ashley. The two have kids the same age, Ben and Kimmie. Ashley, however, has some issues and so she up and leaves for Mexico with a mystery man. Kimmie is left behind in Meredith’s care. Meanwhile, Brian Hutchinson aka Hutch, is a former member of Delta Force. He’s the only person in his team to survive a mission. So, he’s battling PTSD and also a psychological scar that has left him without a voice. Brian goes home to Twilight, Texas and ends up pepper sprayed by the beautiful stranger who happens to be living in his house. Fortunately, the two get past that, and begin to form a tentative bond as they find themselves working together to take care of Kimmie as well Ben. Unfortunately, the secret Meredith aka Jane is hiding might just come back to haunt her and put a damper over Christmas. I had assumed that maybe Meredith might be hard to like because she keeps herself so uprooted and closed off. I thought she would be hard to get to know and that we might not see her be vulnerable. I was wrong. Wilde writes Meredith in such a way that you can’t help but feel for her. She has had a very hard life and what she has experienced is enough to give anyone PTSD. I found Wilde’s portrayal of a woman who was a domestic violence survivor to be fascinating. By this I mean that I thought it was realistic how safety was always Meredith’s first consideration and how much went into her safety planning. Then, there’s the added element of who the abuser is that makes it even scarier. Meredith’s abuser is a police officer, and well, that adds an extra layer of fear because he’s got access to different records systems, training in weapons, and the trust that goes along with a badge. I just thought that Meredith was a really well drawn character and it’s her journey from fear to trust and confidence that really won me over when it comes to�Christmas At Twilight by Lori Wilde. If you like books that have extensive character development, �you should pick this holiday romance up. The romance between Hutch and Meredith is different from other romance books that I’ve read. First off, there’s not the characteristic banter that I typically love because Hutch can’t physically speak at the moment. Instead, he communicates using a toy magic slate and body language and gestures. Meredith uses her words though. It’s interesting though, how much communication takes place between the two without using words. I loved how at first there’s this spark of attraction, but they resist each other. Slowly, they bond over taking care of Ben and Kimmie. The children have an important role to play in this book. Eventually, trust is built between the two, but it’s hard won. I liked that. For me, when I read a romance book, I like it when the pairing takes some work and isn’t immediately easy. There’s a lot of Christmas cheer in this book, mainly centered around Christmas cookies and holiday activities that take place in the town of Twilight, Texas. There’s a Christmas eve and Christmas scene as well as New Year’s. However, the main focus is not the magic of Christmas or anything like that. It’s about two wounded people who eventually learn to leave the past behind and embrace the present and each other. I would recommend this book if you like holiday romances that are subtle and not totally in your face. I’m glad that you liked this book so much, April. I haven’t read anything by Lori Wilde, and for some reason I’ve never been that intrigued. But maybe I should look into her books, or at least this one, since you liked it so much.